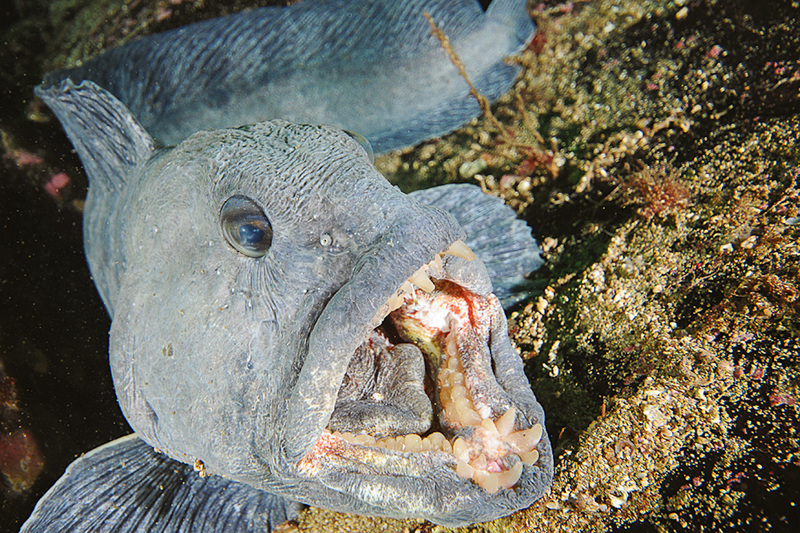 We have our own “house” Wolffish on our house reef and you can see it on at regular intervals. This is a fish that has no natural enemies in our waters, but it is not as dangerous as appearance apparently dictates. It´s Blue color makes it easy to see, compared to our smaller species. Seeing a big stingray cruise slowly above the bottom is both impressive and beautiful. They hunt for food near the bottom, and they’re usually found on sand. Their mottled pattern is perfect camouflage, and sometimes their eyes are the only thing giving them away. They are intelligent fish and often display interesting behavior. This is one of our most popular dive sites, located just 15 minutes away. It’s easy to reach and offers exciting encounters in almost any weather. The sandy bottom slopes from about 14 to 20+ meters, and stingrays are spotted on almost every dive. The stingrays are a beautiful sight when they glide gracefully over the bottom. The megrim (Lepidorhombus whiffiagonis) is an unusual sight. It lives in deep water, but is often spotted at Stingray City. If you thought the Norwegian west coast did not have coral reefs, think again! In many places where there are strong currents, the dead men’s fingers thrive. They can form reefs stretching for hundreds of meters, completely covering the rocks on which they grow. Above you very often have giant kelp swaying in the current, and it’s a spectacular experience to be rushed along the sparkling colors by the current! The kelp canyon is made up of millions of huge Laminaria kelp plants, which may reach a height of over two meters in certain planes. It is the single most important habitat and ecosystem along the Norwegian coast, offering food and shelter to hundreds if not thousands of species. Don’t spend the entire dive hovering above this ever-moving kelp landscape – when you look underneath the canopy there’s a world of critters waiting for you! Underwater photographers are especially fond of the drift dives we do. The brilliant colors promise some spectacular footage, although it may be difficult to shoot stills if the current is strong… A GoPro is an excellent thing to bring on one of these dives!